2010 magazines folded | Can someone please explain...? Does al-Qaeda’s magazine Inspire accept advertising? 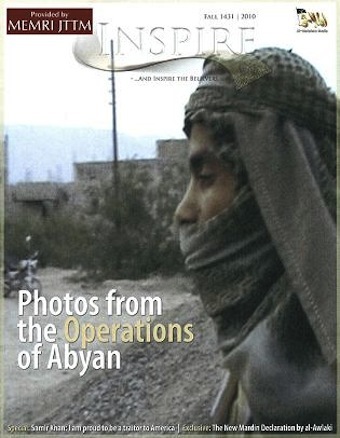 But of all the new launches this year, the breakout title for me is Inspire, the magazine of al-Qaeda. It’s published in English out of Yemen and edited by a 24-year old Pakistani American from North Carolina, Samir Kahn. With catchy articles like “Make a bomb in the kitchen of your mom” and instructions for turning your pickup truck into a steel-bladed “mowing machine” for mowing down enemies, the magazine is sure to deliver a unique audience. Does anybody know if Inspire sells ad space? I wonder what kind of added-value the magazine offers to its advertisers? Laminated copies of the ads with the words, “As seen in Inspire” slugged into the upper right corner? Free advertorials? Survey cards? Maybe they let advertisers rent the subscriber list at a discount? If that’s the case, can someone please explain to me how I can get my hands on that list? I can think of a Navy S.E.A.L. team that would love to hand deliver a special promotion to the readers.